Workers of all Countries Unite! Defend the Right to Organise! 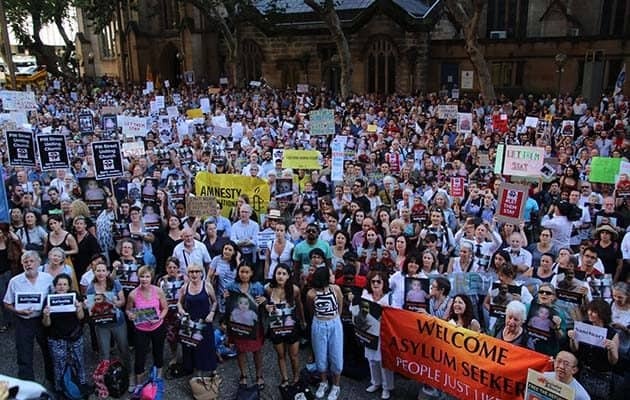 The High Court decision that offshore processing is lawful has triggered a massive wave of defiance and protest, from the churches to the Labor Party.Tens of thousands have demonstrated, signed petitions, and called MPs to demand that the 267 asylum seekers brought from Nauru and Manus Island are allowed to stay in Australia. Churches and the Victorian Trades Hall have committed themselves to defying the law and offering sanctuary; The Age has editorialised against offshore processing. Now, the stand of staff at the Lady Cilento Hospital in Brisbane not to discharge baby Asha to be sent to Nauru has galvanised support for the “Let Them Stay” campaign. The support for the hospital has been fantastic. With a 24-hour vigil and daily rallies, opinion polls are shifting toward asylum seekers. Hundreds of workplaces have hit social media to show union and workers’ support. If we can harness the growing opposition, we can win the demand to keep the 267 asylum seekers in Australia and go on to build the movement against offshore processing and mandatory detention. The letter from Victorian Premier Daniel Andrews to Prime Minister Malcolm Turnbull calling for the 267 to be allowed to stay was a political turning point. The Australian Education Union quickly backed Andrews’ call. Andrews’ offer turned up the heat on Turnbull. But it has also turned up the heat on federal Labor. Four Labor state and territory leaders have called on Turnbull to let the 267 stay. So far, Bill Shorten has fallen in behind Turnbull’s position; restating federal Labor’s support for offshore processing and that any returns should be considered on a case-by-case basis. A serious stand by federal Labor would politically transform the situation. The union support for baby Asha, and the “Let Them Stay” campaign needs to be stepped up. The state premiers need to go further and declare they will block any removal. By increasing the union and community campaign, we can make it politically impossible for Turnbull to remove any of the 267. Socialists have long argued that a mass campaign of meetings, rallies and grassroots organising can raise awareness, shift public opinion and mobilise the force of organised workers to change government policy. The current upsurge in support for refugees is a vindication of this strategy. It is now very obvious that the arguments made by Robert Manne and others, that the movement should go quiet, accept that Abbott had stopped the boats and accept the bi-partisan support for offshore processing, are wrong. From the beginning of the campaign, socialists argued for a focus on the union movement and mobilising organised workers in support of refugees—to build support among the most powerful group in society and to break the Labor leaders’ bipartisan support for turnbacks and offshore processing. It was the mass movement under Howard last time that shifted public opinion, and pushed Labor to promise permanent protection and to close Nauru and Manus when it came to power in 2007. The Coalition’s racism and fear-mongering is aimed at the working class. We can organise most effectively against the Coalition and pressure the Labor Party leaders by building inside the unions. Last year there were demonstrations against the Border Force Act and at hospitals with “Detention Harms Children” banners. The number of teachers and schools involved in the “Let Them Stay” campaign has dramatically increased since last year (see p6). The ACTU published a full page “Let Them Stay” ad. State and national union secretaries have been at the Lady Cilento rallies. We need more resolutions from the unions and workplaces to draw wider layers into the rebellion against Turnbull. So far, the government has not dared to remove anyone. But Turnbull still insists that the asylum seekers will be returned. Everyone needs to be ready to mobilise at the detention centres and the airports, if that is needed. The government attempts to make a false link between refugees and terrorism and uses refugees as scapegoats for the government’s failure to provide jobs, or fund housing and health care. Yet Turnbull pays Transfield/Broadspectrum over $1 billion a year to run the offshore detention centres and lets big business get away with avoiding tax. We need to fight to end the government’s cruel detention regime and fight to end their system of crisis and war that constantly creates refugees. This entry was posted in Recent. Bookmark the permalink. Munroe doctrine returns to attack Cuba ... on Just how stupid is Trump? Justice on Last train for Julian Assange? Solidarity with Julian Assange on Last train for Julian Assange? Ciaron on Last train for Julian Assange? ian on Last train for Julian Assange? Extinction Rebellion on Is Big Coal a Train Wreck? Victoria's interview with Andrew Harding on Is Big Coal a Train Wreck? A note to indigenous people, Workers BushTelegraph may contain recordings, images and songs of people who are deceased. 1. Industrial question: The Master/servant relationship. The struggle for Worker Control. 2. Ownership question: Who owns the land? Rights to the city, right to country. The struggle of indigenous people for land rights and social justice in Australia. 3. Political question: This is the class struggle. Who owns the means of production? Who governs? How are democratic rights won and shared. 'Rob Pyne - a far northern life' — sharing stories of Rob Pyne's struggle inside the ALP and his move to independence. Contains some excellent chapters about his stint in parliament. MUA – here to stay! Bent Banana Books — Save the Book - discussion on where books are heading and finding books which are different. Apple Corey — Contains some excellent interviews on Indigenous, union, women, Occupy issues. Rob Pyne - a far northern life — sharing stories of Rob's struggle inside the ALP and his move to independence. Do the US Marines in Darwin pose a risk to our peace and security ? Is Big Coal a Train Wreck? Where in the world is anyone safe? Climate Justice in Western Civilisation? Last train for Julian Assange? Copyright © of the article, photo, video, etc lies with the contributor. Copyright © of the website belongs to Workers BushTelegraph. Others may copy, distribute and create derivative works from original articles, videos, images on Workers BushTelegraph with permission of the author. You may download files, but if you redistribute them, please attribute them to BushTelegraph. Please don't use them for commercial reasons without the editor's permission. Please do not alter them without editor's permission. To download a file right click on the link and choose 'save file as' or 'save link as'. *Industrial - Master/servant relationship. The power of boss over worker. *Ownership - The struggle of indigenous people for land rights and social justice in Australia. Rights to country, right to city. *Political - The class question. Who should govern? Who owns the means of production? Why and how? Workers BushTelegraph is primarily for original articles, original news, stories you can’t read elsewhere, original verse, original pictures, videos and music. If you wish to have something published please write to the editor. Authors will be contacted for approval before publication. Comments are published automatically and are the responsibility of the author. Please keep comments as short as possible (less than 200 words). Email addresses given by commentators are private and are not distributed without their knowledge and consent.